On Nov. 3, Trish McKinnon and Karen Summey had a night to unwind. The job of a caregiver doesn't allow much time for rest and relaxation, so it was a much-needed break from it all. The duo was among four caregivers honored at an event hosted by Kevin and Joe O'Loughlin at Claygate Estate Vineyard in Newberg. The O'Loughlin brothers are caregivers for their sister, Mary, who has multiple sclerosis. They hosted the event – which featured live music, food and drink – to raise money for local caregiver organizations and the MS Society. "That was a really special event," Summey said. "The people that put it on are caregivers to their sister, so they are understanding about what caregivers go through. It was really nice to relax, have a glass of wine and celebrate some great people." 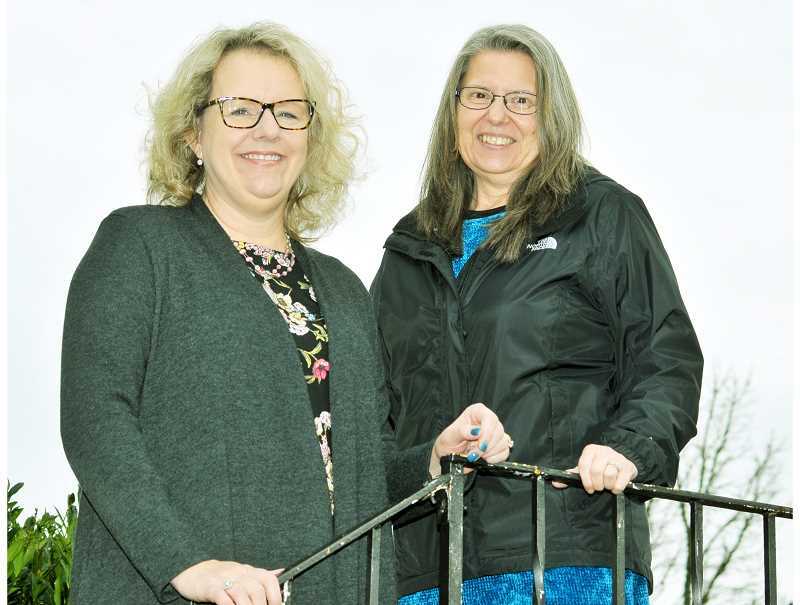 Summey and McKinnon are part of the Community Connections: Faith in Action group at Providence Newberg Medical Center that provides support to caregivers in the area. Faith in Action seeks to build partnerships with local faith-based organizations to find volunteers willing to work as caregivers and provides a support group to established caregivers in the area. Summey's experience as a caregiver includes taking care of her husband, who has Lewy Body Dementia – the second-most common form of dementia behind Alzheimer's. She also cares for her daughter, who has paranoid schizophrenia. Caring for her two family members is a time-consuming endeavor, Summey said, with every day requiring constant attention to their needs. "It can be very stressful physically and emotionally," she said. "It can be exhausting. It's really important to manage the financial and legal aspects as well." Summey said that Northwest Senior Disability Services has helped her navigate the process and has been a "tremendous help" over the years. So too has been the Faith in Action support group, which she said helps caregivers like herself and McKinnon reflect on their own needs and connect with those in similar situations. "The caregiver needs to take care of themselves in order to take care of others," Summey said. "There are so many times that the caregiver passes away before the person they are taking care of. That's why Faith in Action is so essential." McKinnon is one of the people Faith in Action recruited to become a caregiver. When she moved to Sherwood six and a half years ago, she joined St. Francis of Assisi Parish and met someone on staff who was working for Faith in Action. Her decision to volunteer as a caregiver ended up being one of the more impactful decisions of her life, she said. McKinnon initially thought the volunteer work would only entail giving a weekly ride to someone who needed it, but it turned out to be like "adding a new member to her family." A Newberg woman named Patricia – who deals with asthma, heart issues and COPD, among other conditions – gets multiple visits a week from McKinnon and daily check-ins via text. Patricia has even developed a friendship with McKinnon's adopted son. "She loves him," McKinnon said. "He has significant intellectual disabilities and she loves and accepts him. She always says that he has a sparkle in his eye." Patricia's condition has improved significantly over the years, according to McKinnon. She said she likes to believe her caregiving had a role in that improvement – playing the role of a family member for someone who would otherwise be on their own. "When I met her over four years ago, she was very, very sick," McKinnon said. "This is the healthiest she's been and I try to make sure she's on top of her appointments and getting the care she needs." For more information on the Community Connections program, visit oregon.providence.org/our-services/p/providence-newberg-community-connections/.